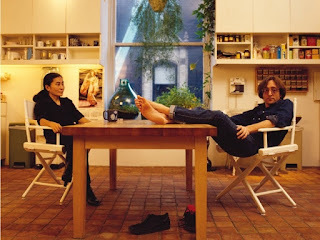 John and Yoko remodeled their kitchen in the Dakota to be more in the spirit of the artists' lofts they knew when they lived downtown on Bank Street. Saltillo tiles, a combination of open shelves and closed cupboards, director's chairs, and a farm table—it's very 1980. Happy birthday, JWL + SOL. it's reassuring to see that in this foto, Lennon appears immune to the cultural virus which consumed Elvis.